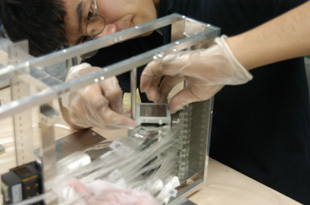 The Instrument Development Laboratory develops advanced experimental instruments in the manufacturing spirit which is the hallmark of Nagoya University. In particular, this laboratory develops 1) new nuclear emulsions that can be used to directly detect dark matter, 2) high-speed data reading and image analysis techniques for large-mass nuclear emulsions, and 3) leading-edge technologies such as radiation detectors, photo detectors, and X-ray telescopes that are invented in-house for high-energy particle experiments and cosmological observations. Figure. 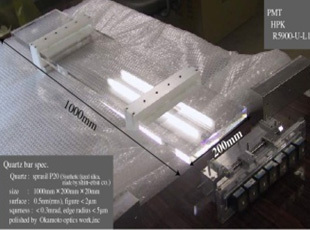 High-speed data reading device for nuclear emulsion (top left). 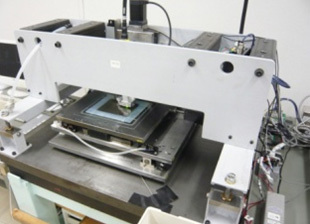 Next generation particle identification detector, TOP counter (top right). X-ray telescope (bottom left). 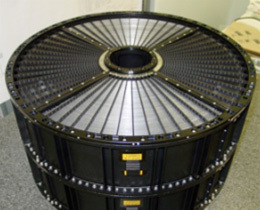 Detector for LHCf experiment (bottom right).